“Once you drink from the Nile, you are destined to return." The old Egyptian proverb holds true for me. Egypt is the gift of the Nile, no one ever doubted. 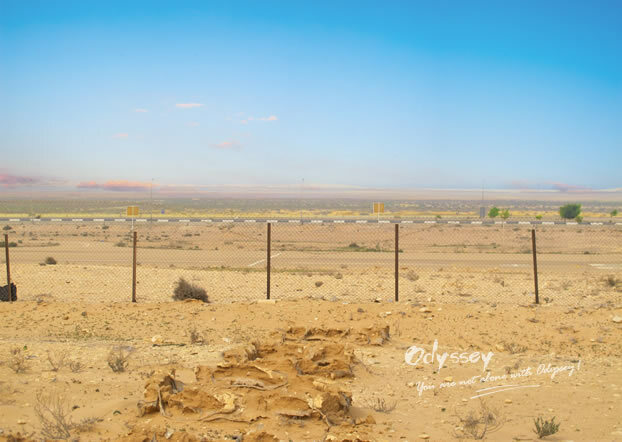 Whether you are watching the sunrise from the lofty heights of Mt Sinai or the shimmering horizon from the terrific safari around Bahariya Oasis, the landscapes of the desert in Egypt are endlessly fascinating. In a land where time is measured by dynasties, and distance measured by the setting sun, there are plenty of opportunities to explore wonders of the past and present. With the austere Pyramids and the endless minarets, Cairo is a city associated with both Ancient Egypt and Islamic Egypt. Egyptians today often refer to Cairo as "Masr", the Egyptian Arabic pronunciation of the name for Egypt itself, emphasizing the city's continuous role in Egyptian influence. 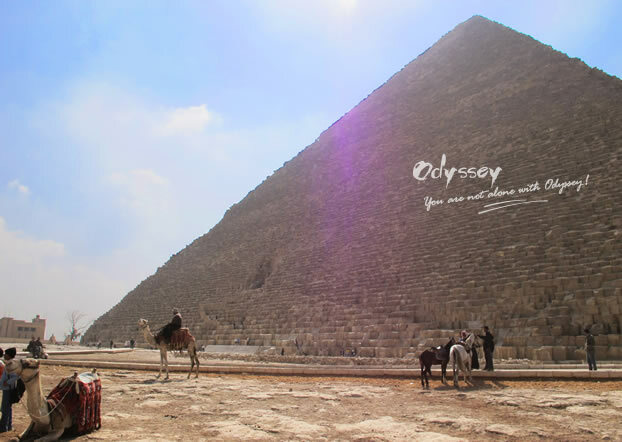 Climb up a slope, the Great Pyramid of Giza will suddenly crash into your sight, just like what it appears on TV, in movies, magazines, and guidebooks. It feels so familiar yet so strange. The massive volumes are located in the desert with a not-deserted surrounding: they are actually plunked in the middle of the congested city suburb of Giza! The picture on the right was taken from the foot of the pyramids that border El Giza, 20 km southwest of central Cairo. The Great Pyramid is great not only in size, but also in its detailed craft - most of the stones were carved tidily and placed accurately at where they are supposed to be. Thousands of years passed by but very few trace left on them. Though there are strong evidence that pyramids are ancient job-creation scheme, it is hard to believe so while standing beside these astonishing achievements. Especially when you get to know about the nature of the modern Egyptians, you might not accept that the Ancient Egyptians were capable of such incredible work. The inclination of the surface is about 52 degrees – steep and dangerous to climb. For quite a long time, the tales of Pyramids constructed by God or visitors from other planets have been widely spread. It's easy to laugh off those seemingly out-there ideas, but after being amazed at the wonders, you'll see why many believe they could only have unearthly origins. The Great Pyramid of Giza tells tales a long time ago. It is a romantic privilege to sit at the foot of the Great Pyramid, having a bird’s eye view of the congested city suburb of Giza in the gentle breeze, or with the song Harem by Sarah Brightman. You could also hold your beloved's hand just like Juliette and Tareq did in Cairo Time, though for now, climbing the pyramids is firmly discouraged. Spend time walking around and appreciate them from different angles. The other day I spent a whole morning at the Egyptian Museum, which houses a rich collection of ancient Egyptian antiquities. Since photography is strictly not allowed inside, I only have pictures of the exterior and record the exhibits with my own eyes. The most impressive artifacts include the priceless funeral mask of Tutankhamen and the Mummy Room (extra entrance fee needed), both are well preserved. However, very few items have English captions meaning you do not get as full an understanding of everything as you could. It is suggested book a private guide to assist you to navigate and enjoy the stories behind them thousands of years ago. Iconic statues of Sphinx and Pharaoh installed before Egyptian Museum. If you want to watch how the Cairenes do business, I’ll direct to Khan al-Khalili Market, an old large souk built in the 14th century and remains the first choice for locals today. The market offers all kinds of clothing, spices, jewelry, souvenirs plus authentic oriental food and coffee shops. The nice hijab is a steal - most materials of which are imported from Italy, Morocco, and Tunis at a reasonable price. Like many other countries, haggling works in here too, but more effective when buying high-value items, for instance, jewelry and gem while low-value items are not worth the time and effort. Some landmarks of Cairo, such as Al-Hussein Mosque, are located in the vicinity - a pleasure to look at while doing shopping. Khan al-Khalili market and the adjoining Al-Hussein Mosque is a delight to stroll. To many travelers, mosques in Cairo do not vary much. If you have difficulty deciding which to visit, the Al-Azhar Mosque certainly will not disappoint you. As one of Cairo's oldest mosques and the most prestigious center of Sunni Islamic education for more than a millennium, Al-Azhar is also a nice playground for local families: mums and dads taking their kids sitting in the central courtyard or napping - it’s less solemn but more personal. A nice place to soak up the sun in the early March. In Mosques, you don't need to worry much about photography taboos since there is no shrine or icon forbidden to be photographed. But you need to dress conservatively, both men and women, it is advised to cover up with proper attire. Sermons are delivered on Friday as the working week of Egyptians is Sunday to Thursday. 208km north Cairo stands a city called Alexandria. Its sandy beaches and turquoise sea water lure thousands of domestic travelers during summertime. 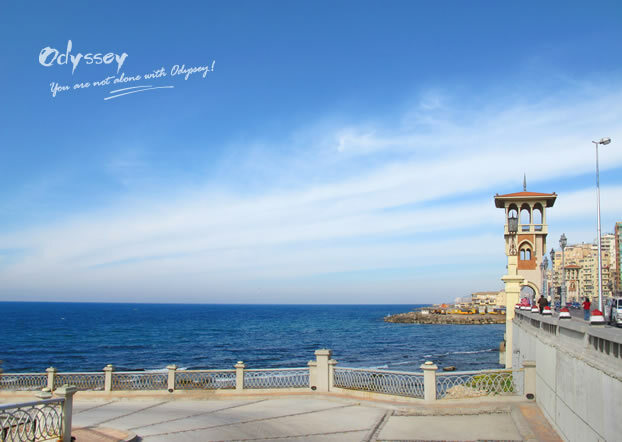 By far, Alexandria is the most phenomenal city, whose mouth-watering seafood, fresh air, lovely weather and ancient buildings (mostly built during the period of Ptolemy) imbue it with an urban pulse distinctly different from that of Cairo. They fondly call Alexandria "Bride of the Mediterranean", and I think it still rings true. Alexandria, the "Bride of the Mediterranean"
Shortly after the city of Alexandria, the original Library of Alexandria was founded by the first Ptolemy in the late third century BC by the sea and attracted thousands of scholars from around the world. However, it was destroyed by fire in 48 BC, so what we see today was reconstructed and officially opened in 2002. Designed as a gigantic angled discus embedded in the ground, the library has an astonishing volume of 8 million books warehoused for knowledge seekers. The spirit of learning is lyrically evoked on the outside walls, carved with giant pictograms, symbols, and letters from every known alphabet. It seems to be fun to find your mother language among. Modern exterior of the library. The more modern interior catering to those who are in pursuit of knowledge. Due west of Alexandria city you will find El Alamein, a small coastal outpost where beautifully keeps WWII war memorials of the North Africa Campaign, during which more than 80,000 soldiers were killed or wounded. In the homonymous movie, El Alamein was described as “where there's nothing except sands". To the north of this forgotten town is the Mediterranean Sea. The War Museum and Commonwealth War Cemetery are located along a quiet side road. Soldiers from UK, Australia, France, Greece and more who fought for the Allies didn’t make it home: 7,000 tombstones cover a slope overlooking the desert battlefield and stand as reminders of the loss of the war. In most time of year, except for wartime or the anniversary of Anti-Fascist War, the place is deadly silent and far from hustles. I was deeply sensational when seeing one epitaph reads: To the world, you may be one person, but to one person you may be the world. It is worthwhile to stop by and commemorate the fallen with a wreath. War Museum isn't a big museum, but the exhibits related to the battle are worth a checkout. Left: Huge wreckages of tanks and cannons displayed outside in the garden. Right: Door to Britain's critical WWII underground communications center. Commonwealth War Cemetery is peaceful and quiet for those resting here. The second part of my Egypt travelogue includes a visit to Valley of the Kings in Luxor, where lies 63 tombs and burial chambers constructed for the Pharaohs and powerful nobles of the New Kingdom 500 years ago. 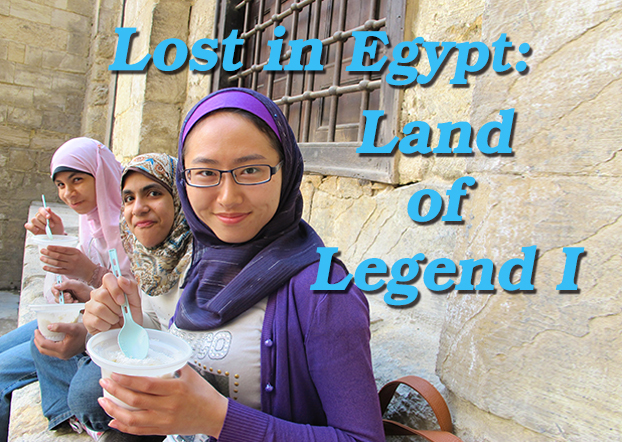 Read the rest of Lost in Egypt: Land of Legend!